It was a privilege to interview the Canadian poet Richard Harrison prior to his reading in Oxford last week. 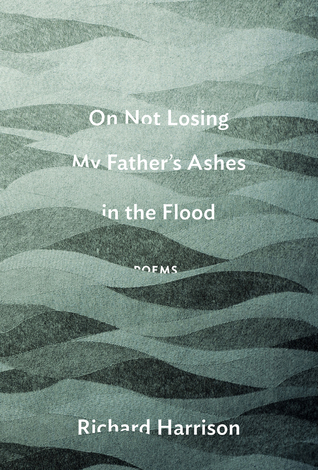 Richard's latest book, On Not Losing My Father's Ashes in the Flood (Wolsak & Wynn, 2016), won the Governor General's Award for Poetry in 2017. The book was also shortlisted for the City of Calgary W.O. 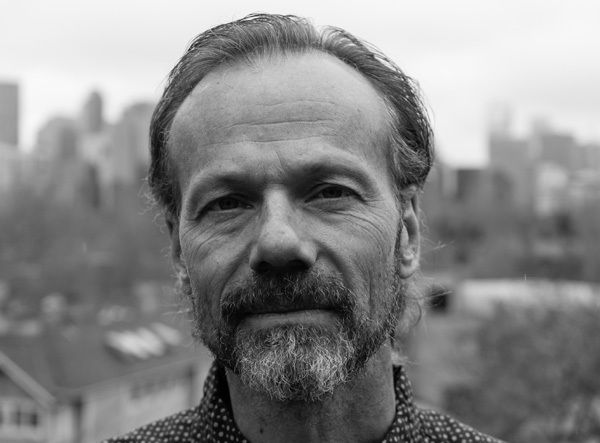 Mitchell Book Prize and won the Stephan G. Stephansson Alberta Poetry Prize. Richard's previous five books of poetry include Big Breath of a Wish, poems about his daughter’s acquisition of language, and Hero of the Play, poems in the language of hockey, launched at the Hockey Hall of Fame. Richard kindly suggested two kinds of interview: one in which he wrote out his answers (and they appear below), and a discussion for our podcast in which we talked around the same questions, with numerous elaborations and interesting digressions! The audio is available on our website. You can also hear Richard reading from his collection here. NM: In your acknowledgements to this book, you credit your editor, Paul Vermeersch, with helping you develop 'the change in my work my father's life and death deserved to effect in it.' In what ways does this book represent such a change? And why was it necessary for a book about your father to respond in new ways? RH: Paul did an enormous amount of good for the book and for me over the course of the year or so we were working on it. What I’m thinking of in that comment is the way his suggestion of spreading the poems out on the page the way they are now led me to rework the entire book in the two months prior to publication. I write pretty well all my poems as pure blocks of text — I just write and let the margins set themselves. No line breaks, no verse breaks; it’s the way I get at the purely oral quality of the art form. For a lot of the qualities of the poetry I write, it works. But I got too caught up in that form, and closed around it. The result was a very unattractive block of words. I could read them. I could read them out loud. And I probably am overestimating their difficulty for others because I did get them published, and a couple of them won awards for single published poems. But Paul saw that the experience of reading them could be much more welcoming, much more open, and so he suggested this new “mise-en-page” format, which appealed to me because it treated words and lines on the page like actors. So I reworked a few poems and both liked them as visual works and found flaws in their oral aspects because the words weren’t protecting each other in their block any more. As I said, it opened the poems, and then the book, up. It let the reader in. It let the reader, and me, feel the poem through their eyes. And funnily enough, this is the only book of mine I can read without my glasses; the space made the words bigger. In terms of my father’s life and death, taking Paul’s advice on this point has let me share my father’s meaning more broadly than I ever have both because it pushed me to make the poems better than they had been, and, from their conversation with me, let them reach others with both my father’s presence — and poetry’s — in a way he would have been happy with. He offered poetry as a way of broadening the world, and this book is the book he couldn’t live to see in part because it couldn’t have been written in his lifetime, and I don’t think I’d have taken such a change as Paul suggested if the book hadn’t meant as much as it did. In a sense, this book is my father’s last lesson, and I think he’d have appreciated both the joke in that and the rightness. NM: When and how did you realise that the disaster of the Alberta floods and your own personal disaster of the death of your father needed to be intertwined in this book? RH: The writing about my father’s life — and, later, illness and death — has always been a part of my work. My father’s recitations of Yeats and Thomas, Browning and Shakespeare, were the ground for my love of poetry. In many ways, some that are in the book, and some not, what was exchanged between us in the poems we memorized together was our most profound conversation. And yet much of him remained absent from me. He was one of those soldiers who rarely, if ever, spoke about his war, though it shaped him immensely. I later learned that that approach to personal history was his for everything that pained him. So of course, I’ve spent a lot of time trying to figure him out, to understand him — and to do so in the language that we shared. I didn’t so much choose the floods as choose to accept their effect. In a way I’d describe as both literal and literary, that bank-overflowing river flooded my writing: my archives and much of my poetry collection were on the ground floor of my house, and the water drenched my papers and threatened to destroy my books. Some of the pages of my early work the water re-wrote, smearing the ink so the pages said different things than what I’d written years before. I know a sign when I see one. I’ve taught that art is our answer to what we cannot change. I was thinking about death when I said it; the flood gave me another unchangeable. And for at least a while, as well as rewriting my past in its own image, it stole away the signs, the proof, of my father’s death, the origin of my definition of the purpose of art. Sometimes art has to bend to the world; it would have been, if not wrong, the denial of a gift not to have put these together. NM: In 'Gone', you write that 'American literature is about grief spread over space'. Is this a fair way to describe your own book? How did you go about constructing the collection and its order? Did you make a deliberate attempt to steer away from a 'traditional' - perhaps rather depressing! - notion of grief? RH: I like the idea that I was describing (also) my own book in that line. Thank you. I’ll have to think more on that. I’ve always thought of that line as marking a distinction between American writing and Canadian (at least as far as I understand either) through the difference between the road-trip grieving of the couple in that poem, taking the groom’s mother’s ashes across the U.S., and my own domestic grief in my father’s ashes lost in one room in my home and found in another. In terms of writing about what we create to define space and our place in it, it might be true to say that where American writing is about cars, Canadian writing is about houses. Of course, if the line is a fair description of my own book, then my poem knew more than I did. The ordering of the book is a good question. 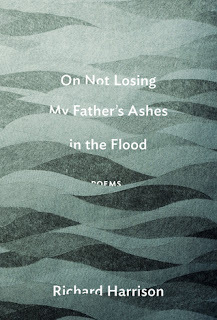 This book feels like it grew in layers: three wider ones — the book about poetry and already-established forms of writing; the book about loss, chiefly in terms of my father’s illness and death; the book about the flood — and a slenderer one about love, with that finest one having the last word. In arranging and interweaving them, I learned a lot (maybe the most) from Canadian novelist Timothy Findley, who was an actor before he wrote prose, about staging and story-telling. As a result, as I alluded to in the first question, I see a book of poems as a kind of play, with a play’s tension between the narrative that drives the characters in one direction and their individual traits and desires that pull them in many. The flood rearranged my house, and much of my city, in that same way. The book was part of that rearrangement and reordering. One thing it did was free me from worrying about the chronological order of the book because after the flood, like all things that came through it, all the poems became equal in a way they hadn’t been before. I’m glad you don’t find the grief expressed in the poetry depressing. I don’t want it to be. A few years ago, when I was interviewing him during his visit to Calgary, Billy Collins said that poetry is sad content in happy form. And I took him to mean the happiness of poetry itself. If art answers death, it must do so with a beauty that elevates us, otherwise it’s no answer, just more death. I also find, over the years, that I subscribe to Wordsworth’s definition of poetry as violent emotion recalled in tranquility, though not as I once thought of that definition — as just remembering a feeling without feeling it, the way we are free to laugh, sometimes, at moments we were in a great rage because we remember it from the outside — but as feeling again an emotion that once overwhelmed us but without it overwhelming us. The poem is how we make use of what once ruled us. So grief is still present in the poem, giving it its weight, but there is also the relief of having grieved, which gives it its lightness. NM: I was really interested in a particular idea in 'The World Made New': 'that terrible excellence' when 'words have no past and in them is the world made new.' Is it possible to wash words completely clean like this? Don't they always hold some trace of history or memory? What kind of poetry has the capacity to make words new? RH: To wash words completely clean, I don’t think so, though I think that sound poetry, Dadaist and Futurist and concrete poetry, Oulippian approaches are all examples of poetry drawn even more strongly than I am by that ideal. And it’s with that in mind that I read and listen to those forms. But I do think it’s an ideal at work even in the poetry that clearly requires words to have history. In a way, those poems, like mine, are trying to trick the words out of their history so that even if they aren’t ahistorical or without a tether to their ordinary meaning, they feelnew, they feel like they’ve been said for the first time. I know it’s an illusion, but I love when it happens, when it makes me think of both the meaning of particular words and of them as without meaning at the same time. It happens for me in “This Poem is Alive Because it is Unfinished” where the women taking care of my father in his last weeks say of him, “He’s our favourite,” and I realize that for me, in that moment, that sentence means exactly the same when its true as when it’s not. If it’s true, it’s a lovely and comforting thing for them to say to me — and I believe it; Dad was a charming man. If it’s false, it’s a lovely and comforting thing for them to say to me — and I believe it; they want to offer me something to hold onto in my imminent loss. And so whether the line is true or not, it does the same work; in fact, it’s poetry, pure poetry in the sense we’re talking about here: it actually does more if it is equally true or false, which is as close as I can get to separating those words from their history (as tied to their truth) and have them mean something new. NM: Part of the complexity and power of the book is to be found in its interrogation of what poetry is and what it can do. Did you discover new things about poetry in the writing of this collection? RH: Thank you. Some of what I’ve mentioned above about art as our answer, and the poem, if only in a line, as finding something more than truth and falsehood, are things I discovered (or discovered what serve as examples for me) in my own work this time around. To return to your first question, I discovered the way the line, as a visual component of the poem, could be used as a test of its aural strength, and that was something I hadn’t been able to make work as well as I wanted to in the past. But as much as I was interested in finding out what poetry was or wasn’t in this collection prior to publishing it, I’ve learned as much if not more in the time since. If I could encapsulate that, it’s to say that when poetry does its work, people respond to it in its language.